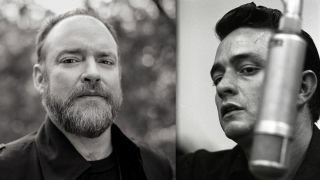 John Carter Cash - the sole offspring of Johnny Cash’s marriage to June Carter – has spent the last decade or so compiling 200+ of his father’s unpublished works. Last year, 43 of those were housed in the Forever Words poetry collection. Now, there’s a unique compilation of the same name, in which a star-studded line-up including Chris Cornell (in one of his final solo recordings), Brad Paisley, Willie Nelson, Kris Kristofferson, Alison Kraus and Elvis Costello - along with both Rosanne and Carlene Cash - have written music for and performed a selection of Cash’s once-lost lyrical creations. Produced by Carter Cash, much of the material was recorded at the Cash Cabin Studios, a space initially conceived as a reading retreat on the Man In Black’s Tennessee estate and now, under John’s stewardship, a busy working production facility. We spoke to Carter Cash about the record’s origins, Cash’s recording approach and working with Chris Cornell on what has quickly become the album’s talking point, You Never Knew My Mind. How did you come to discover the material that has become these songs? “When my father passed away, his office was just off his bedroom and it was also a library. He loved books, you know? He had papers all tucked in different drawers, some stuff in a safe in his office. I went through all these things and I think, as any child would [feel], the writing of my father touched me. “I did research to determine what was unpublished and there were about 200 unpublished works, which ranged from when he was 12 years old - there’s one I think might be from maybe a little bit earlier, maybe 10 - all the way up to just weeks before he passed away [in 2003]. How did that manifest itself? Was he interested in sound, as in an entity distinct from writing or performance? “When I worked with my father - and I should preface with that, because there were many times in his life when he went in different directions - it was all about the song. That was number one. That was a sort of credo for him and Rick [Rubin, producer of the latter-day American Recordings series] and the whole production team. Number one was the fact that my father be at the front. That’s why there’s no bass on any of those records, because he is the bass! “Number one, also, was the fact that my father be at the front. That’s why there’s no bass on any of those records, because he is the bass! The nuances of his voice, you can hear every touch of his inflection in those last recordings that he did. Working with my father, we knew that during that time it would be a bare essence production. How much of the recording of Forever Words was done at the Cash Cabin Studio? “All but seven of the 16. And I was at the recordings for all but a couple. The majority was done at the Cash Cabin Studio. The Brad Paisley track [Gold All Over the Ground] was done just down the road, but his heart was so into it, man. “I handed him the lyric and what came out of his mouth was the song in its entirety. I happened to have my phone and he asked me to record it as he got going with that guitar, so I recorded him and, spontaneously, the whole thing was written. Can you describe the space and history at the Cash Cabin Studios? “It was a one-room log cabin originally, with a [sleeping] loft upstairs. It was a place that Dad put in the middle of the woods across the street from his main house because when he’d get back from being on the road sometimes it would be louder at home than it had been when he was travelling, so he had that cabin built in the woods in 1978… He would read and just find peace and calm. “We’d spend the night there, he and I. I would watch movies, while he would sit on the porch and read or write. He’d tool around in the kitchen and fry baloney sandwiches. It was just a place of peace for him. What were the main acoustics for the recordings? Did you use any of your dad’s old gear? “Yeah, his black Martin was used on a couple of things on the album. Then there’s a Recording King guitar that was used. The number one guitar at the cabin is the Roseanne Cash Series Martin [OM-28] and we use that as the go-to, best-kept guitar at the cabin. But his instruments are there and we do use them sometimes. “His black Martin, the one that he played on the American Recordings series - he recorded that whole first [American] album, just him and the guitar - and he beat that guitar to death! He dropped it and knocked it. His hit marks are all over that guitar. The Chris Cornell session for You Never Knew My Mind seems to be really resonating with people, understandably. How would you describe the atmosphere of that session? “Chris took the whole thing as a very serious endeavour. You Never Knew My Mind was originally two separate pieces. One was ‘you never knew my mind’ and the other was ‘I never knew your mind’. They were the same song, really, just slightly different in some of the lines and the person [narrating]. “Chris had been through a divorce and my father wrote that in 1967, when he was in the midst of his divorce being finalised, and Chris related deeply to that. He took a while to write it. It was three weeks, then he sent this mp3 of the demo and it affected me deeply. It’s so powerful. What have you learned about your father, seeing him through the eyes of others, as you have done in this process? “I feel like I’m seeing through a different pair of glasses now that I’m a little bit older, now that I’m 48. I was younger when my father passed away, so it’s almost like I’m communicating with him. I don’t know that I’m more mature. I’m just different. I’ve had more experiences. Johnny Cash: Forever Words is out on 6 April via Legacy Recordings.